Can the Taiwanese manufacturer make play in the gaming market? Can MSI cut it in the gaming laptop market? 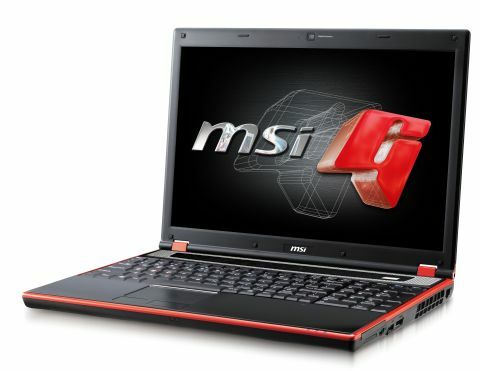 The MSI GX740 is a gaming notebook, and is a very powerful machine featuring the Intel Core i5 processor and a high-end ATI graphics chip. The real selling point of this machine is its price, and this much power for under £1000 makes it a very affordable option, especially when the likes of an entry level Alienware M17x, providing very similar performance, will cost you around £500 more. As we'll see, however, cuts have had to be made to keep the price low. Some people like their gaming rigs styled with all the bells, whistles and flashing lights. Personally we don't, and it's fair to say that the GX740 has struck a fine balance between sophisticated and showy. The lid features a brushed aluminium finish which looks and feels fantastic. It isn't shiny in any way and is therefore easy to keep clean, and also resists fingerprints and scratches well. The same material is repeated on the palmrest. Again, it's very easy to keep clean but we did notice the area got a little warm after prolonged gaming sessions. It certainly isn't uncomfortable, but worth noting. Significantly more irritating is the intrusive specification sticker MSI has slapped on the left hand side of the GX740's palmrest. The company has an irritating habit of doing this, having previously stuck something similar on the excellent MSI Wind U160 netbook. Why you'd want to stare at an ugly silver sticker is beyond us, and it wouldn't be such an issue if it wasn't near impossible to remove without leaving acres of glue behind. MSI's traditional red trimming adds a splash of colour to proceedings, and offers a nice contrast to the dark brushed aluminium. Above the keyboard part of the speaker system sits behind a metal grill, with a bank of black and red touch-activated hotkeys positioned in the centre. This looks great, giving an almost retro flavour. The GX740's 17-inch screen is pretty decent. It doesn't feature a full high definition (HD) resolution, plumping for a 1680 x 1050 instead. This, of course, means that it features a 16:10, rather than a widescreen 16:9, aspect ratio. While not all games support a widescreen mode, most do these days so it seems a little strange MSI has implemented this technology, and has a lot to do with keeping costs low so as to pass on savings to the consumer. It shouldn't cause a problem when playing games, as you can alter the settings of most titles to suit your screen, but widescreen movies and TV will appear with the classic black letterbox sandwiching in the picture, which might not suit everyone. Nevertheless the GX740's panel is bright, detailed and colourful, with contrast especially impressing. Games and films look fantastic, and the shiny Super-TFT screen coating is surprisingly effective at suppressing irritating reflections in bright light. The keyboard is mounted fairly well into the GX740's chassis, but there remains quite a bit of flex when typing at speed or gaming hard. Also, despite the large chassis, the board feels a little cramped, and to accommodate the dedicated number pad the Backspace, Enter and Shift keys have been cut small, and are quite easy to miss-hit as a result. MSI has painted the WASD keys – commonly used gaming keys – red, making them easy to locate during frantic gaming, which is a nice touch. Set just above the keyboard is the row of touch-activated hotkeys mentioned above. From left to right they control your media (skip back, stop, pause/play and skip forward), activate MSI's Eco mode, Cinema Pro mode, webcam, Bluetooth, Wi-Fi and a programmable button. All the keys glow blue when activated, and all are quick to respond. The media controls work great and are compatible with players such as Spotify, but we'd liked to have seen volume control buttons also included. The GX740's Eco button lets you switch between various power programs to help you get the balance of battery life and processing performance right, and includes a gaming mode, movie mode, office mode and turbo battery mode. The Cinema Pro hot key is designed to provide greater screen detail and higher sound quality, but the only noticeable difference was louder speaker play back, and we can't envision anyone using the feature much.